Situated on a grassy knoll in New Hampshire, just minutes from downtown Brattleboro, Vermont and Massachusetts in the Connecticut River Valley is the luxurious and historic grounds of The Chesterfield Inn. I had the privilege of spending time there recently and realized what a gem this property is. This is a place I could visit in a snow storm and be perfectly content to stay in my room… well, except for meals, which I would never miss here. Ask us about Chesterfield Inn or share comments. 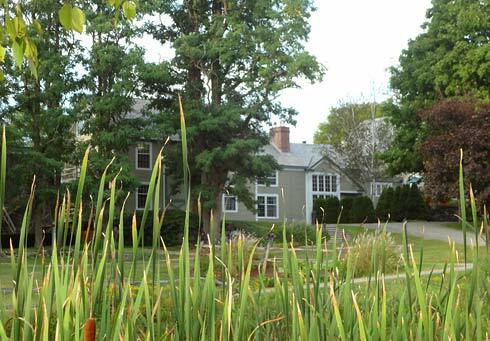 To feature your Vermont Inn, contact us. First, many of the rooms at the inn are adjacent to the main building, staggered and therefore very private even though they may be connected. Many have private balconies with tables and chairs. Perfect for morning coffee in your robe, deli lunch, cheese, crackers and wine, or dessert and after-dinner beverages, weather permitting, of course. Inclement weather outside means moving inside to gas fireplaces, large relaxing arm chairs with hassocks, flat screen TVs and jetted two-person tubs in some rooms. What more does a body need when the chill is in the air? Oh, and how about a nap in a bed that you need a stepstool to get into? All this, and a comforter too. A New England Inn at its best. However, as wonderful as the rooms are, there is an even better side to The Chesterfield Inn (and you do not have to stay there in order to enjoy it). It’s the food! This is enjoyed in a selection of eating areas. A larger dining room is available when there is a full house or large party. The smaller, more intimate area is surrounded by windows to watch sunsets and the vista. The outdoor patio can be appreciated for fabulous weather dining. The best part was the interaction with the other guests. We shared opinions of dishes (some guests had been there several days) and suggestions to newcomers later in the evening. What a culinary experience. If you have ever had the Maine Smoked Salmon with Grafton Cheddar and Chive Cheesecake garnished Ale Mustard, then you already know about one of my all-time favorite appetizers. I am sure the other ones were delightful; this was just my choice. The flavor combinations only went up from here. Grilled Filet Mignon with Goat Cheese, Venison Scallopini, Pan seared Duck Breast, Seared Sea Scallops, and Rack of Lamb were some of the choices. Our meals were excellently prepared, presented well and cooked to perfection. The menus change frequently to reflect the seasons. 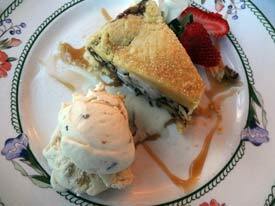 Dessert choices ranged from Grand Marnier Creme Brule to a pecan torte and chocolate mousse. All can be accompanied with your choice of several domestic and international wines by the glass or bottle. They also have a good sampling of locally brewed beer and ales, as well as a full liquor license. Well, I wondered how breakfast would top dinner. With fresh fruit, Inn granola with yogurt, cinnamon maple French toast with real maple syrup, eggs, omelets, homemade muffins, juice, coffee, you will not walk away hungry from this incredible restaurant. Last but not least, the people of the Chesterfield Inn are extraordinary. What more can I say. You are treated with such importance and courtesy from the minute you check in to solving a problem or getting you more coffee. That completes the stay and leaves you with a simply wonderful feeling.